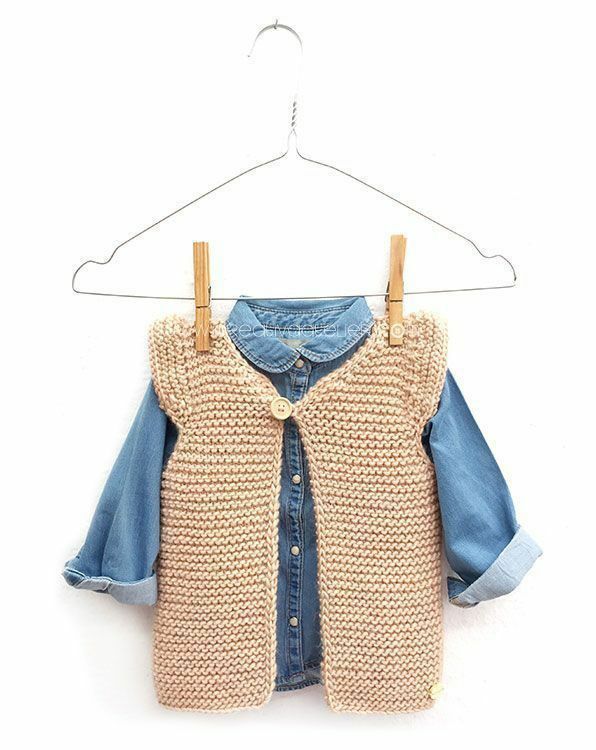 The Knitted Girly Vest that I show you today is one of those clothes that should not be missing in a kid’s closet. Combine it with a worn denim shirt and you will get a modern look that will attract attention wherever you go. This pattern is one of the easiest to make due to its simplicity and since it is knitted with a thick yarn and large needles, you will have it finished and ready in no time. The MeriWool from We Are Knitters in salmon. Start by casting on 80 stitches and knit in Gartner stitch for 28 turns (56 rows) or until your knitting reaches up to 21 cm. Once knitted 56 rows, began to shape the armholes of the Knitted Girly Vest. Knit 21 stitches, cast off two stitches (pass the second to last stitch over the last one, knit one stitch and again pass over another to cast off), knit all stitches until there are 19 stitches, cast off two stitches and knit the remaining stitches. On the next row, knit until 3 stitches remain, knit 2 stitches together and knit the last stitch. Turn the work over and knit the whole row normally. Continue in this way, knitting two stitches together and 1 stitch, each time 3 stitches remain to reach the opening of the armhole. Once you have these 15 stitches, knit 13 more rows. At this point you should have all the stitches on the same needle. Cast off 3 stitches and knit the row normally. You must knit 2 stitches together each time you reach the area of the neck opening until you get 6 stitches. Once you have 6 stitches, knit 4 rows and cast off all the stitches. Continue knitting the 38 central stitches to shape the armholes of the easy knitted Girly Vest. In this case, you should make a decrease on each row. When you have 3 stitches to finish the rows, knit 2 stitches together and knit the last stitch. Continue decreasing in this way until you get 30 stitches. Knit 28 more rows and cast off all the stitches. To finish the base of the knitted Girly Vest, you will have to knit the remaining front part. In this case, knit the same way as you did for the first one. Cast off 3 stitches for the neck and knit the row normally. Knit 2 stitches together each time you reach the area of the neck opening until you get 6 stitches. Once the knitted vest is formed by joining together the shoulders, you will have to pick up 26 stitches by inserting a needle through the loops that have formed on the selvage. Remember that for this, it is very important that you slip the first stitch of every row without knitting. Row 1. Knit 6 stitches, increase 2 stiches from each the following 5 stitches, increase 3 stitches from the each of the following 4 stitches, increase 2 stiches from each the following 5 stitches and knit 6 stitches. To improve the finish of your vest you will knit a border of slip stitch with a crochet hook. If you do not use crochet to finish your knitted projects, what are you waiting for! You do not have to be an expert in crochet or know the most intricate techniques, with a couple of the most basic stitches you can improve the edges of your fabric and vive that extra sophistication to your hand-knit garments. When you reach the neck area, you will crochet the closure of your button. Crochet a chain of 6 (or the ones you need depending on the size of your button) and close it by making a slip stitch at the base of the chain. 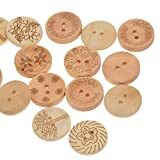 Then, simply by sewing a button you will have your Knitted Girly Vest finished! 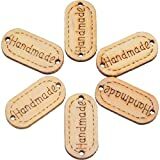 If you want to add a wooden label, like the one you see in the photos, with the inscription –Hand Made- to give it that special touch, I leave the link where I buy them for cheap. I love how this girly vest goes with the cowboy look and the UGG booties. She uses them with everything! If there was not yet a knitted vest among your repertoire of knitted baby garments, you already have a new project on your “to do” list! Easy, quick to knit, simple, economical and above all, modern. If you are loving the ruffles of this Girly Vest, I am pretty sure that your are going to love this Baby Sweater with ruffles on the sleeves and this romantic Summer Set.